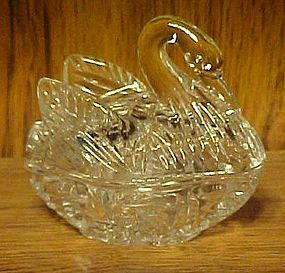 Pretty two piece pressed pattern glass swan on a nest candy container, or pin dish for your dresser. Clear glass and measures 3 1/2" tall and has no damages. I have 2 available. Price is per swan. This would make a lovely gift. 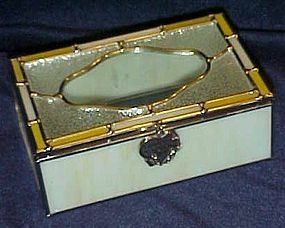 All leaded stained glass (or slag) box with heart shape charm that says: I said a prayer for you. Creamy vanilla color slag glass with clear glass and pattern glass design. Measures 5 1/4" long, 1 3/4" tall, and 3 1/2" deep. Excellent condition, with new stickers still intact.